Nigerian unions have issued the government with an ultimatum. Either re-introduce the fuel subsidy that was scrapped at the beginning of the month, or the strikes will escalate to Nigeria's oil production. Oil production accounts for 40% of GDP, and any such move would cripple the already fragile economy. The unions have suspended strikes, demonstrations, and rallies, for two days, in order to give the government time to consider the ultimatum. After five days of strikes, demonstrations, and clashes with security forces, Nigerian trade unions have issued the government with an ultimatum. They have given to the government until Sunday to reinstate the fuel subsidy that was scrapped on January 1st, or workers from the country’s largest oil exporters will go on strike. Whilst Nigeria would be able to export ‘some’ oil, it has been suggested that the Nigerian economy could collapse, and that it would have a detrimental effect on fragile oil prices around the world. World prices have risen slightly over the last day, based on ‘threat’ of reduced production. Nigeria is Africa’s largest oil producer, and the 8th largest in the world, resulting in 40% of their GDP coming from oil exports. Estimates have put the cost of the current strikes as over $1 billion a day. This is a significant amount when you consider that the vast majority of the population live on less than $2 a day. In order to give the government time to respond to their demands. The unions have suspended strikes, rallies, and demonstrations for two days. This will be reviewed on Sunday evening. The last week has seen many people die in clashes with the police, and many hundreds injured. 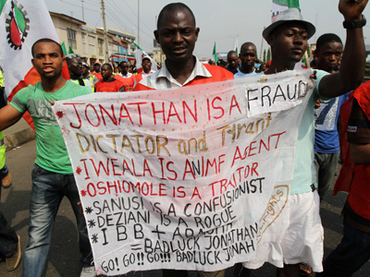 Cities throughout Nigeria have seen huge protests and rallies. A curfew remains in place. Incidents of sectarian violence across the country between Muslims and Christians have been commonplace over the last month. It has been reported that around 100 Christians have been killed in bomb attacks. These attacks have been attributed to Boko Haram, a terrorist group hoping to establish an Islamic state.